Remember all the defensive problems the Red Sox were having for the first two-thirds of last season? All those games thrown away by unearned runs? Then it shouldnt surprise you to learn that the world champs finished with the fifth-worst fielding percentage in the majors. But it may be quite surprising to learn that Fenway Park may have had a lot to do with it. The boisterous support of the Fenway Faithful notwithstanding, it turns out the Red Sox suffered a serious home field disadvantage. It may be a great place to watch a game from the stands, but its one of the toughest parks in which to play. Which is why the changes theyre making to the field this offseason may contribute as much to the teams success next year as anything theyve done to the roster. 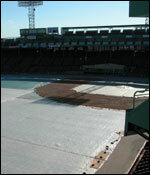 Fenway has long been known among players as one of the worst fields to play on in baseball. It came in near the bottom of a poll by Sports Illustrated a few years ago. And, baseball being wonderfully dissectible statistically, the numbers bear out that reputation. According to the Bill James Handbook, in 2004 the Red Sox made a total of 66 errors at Fenway (in the 72 American league games they played. The Handbook doesnt include interleague play in this stat category). But they made just 39 on the road. Whats up with that? And the difference isnt just with the Sox. Opponents in those 72 games at Fenway made 56 errors, but just 47 in the games they played against Boston in other ballparks. And it wasnt just last year. The Handbook reports that for the 2002-2004 period, The Sox made 160 errors at home, 130 on the road. Opponents made 151 at Fenway, 123 in games played against the Sox in other parks. Is it the infield? The outfield? Its both. From 2002-2004, the Red Sox committed 80 infield errors at home, 48 on the road, and opponent infielders erred 65 times at Fenway, and just 51 times at other parks. While Red Sox outfielders made 80 errors at home and 82 on the road, (the Manny factor?) opponent outfielders erred 86 times at Fenway and 72 times at other parks. True, both teams play on the same field, so the visitors suffer the same bad bounces the Sox do and Fenways problems shouldnt put Boston at a disadvantage. But if the Sox want to raise their fielding percentage, they need a truer field to play on for half their games. So this offseason, the Red Sox owners did something even more fundamental to shore up their defense than signing Gold Glove shortstop Edgar Renteria. Boston.com correspondent David Roepik lifts the curtain and sheds light on the inner-workings of one of baseballs oldest ballparks.